Former Ute player and coach Jay Hill’s program has become a Big Sky power. 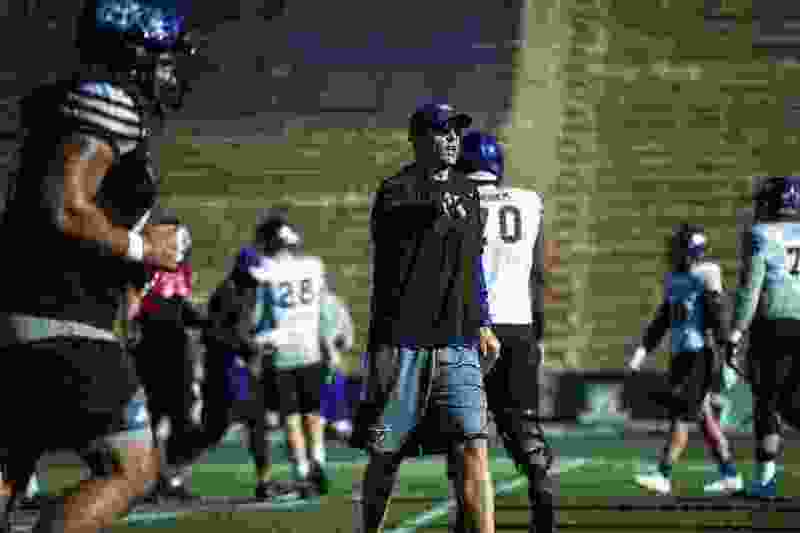 (Chris Detrick | The Salt Lake Tribune) Weber State football Head Coach Jay Hill during a practice at Stewart Stadium Wednesday, October 4, 2017. Ogden • Pac-12 football teams will launch the season this week, facing the likes of Auburn and Ohio State. Utah’s opponent? Just Weber State. Make that #JustWeber, a formerly self-effacing phrase that has become a campus rallying point. The Wildcats, ranked No. 8 in FCS preseason polls, might be the best Big Sky Conference team the Utes have faced in this decade. They've come a long way since 2013, when they last visited Rice-Eccles Stadium. That's when Utah scored a seventh touchdown just before halftime in an eventual 70-7 victory and a coach was furious about the Utes' running up the score. That's understandable, although the incensed offensive coordinator was Utah's Dennis Erickson. He came down from the press box to the locker room at halftime and was “ripping us” for scoring too much, said Jay Hill, then one of Erickson's offensive staff members. The scene helps illustrate the state of WSU football five years ago, three months before Hill took over the program. After losing his first nine games, Hill has gone 26-14 with a Big Sky co-championship and an FCS quarterfinal appearance in 2017. GETTING BETTER Jay Hill’s Weber State coaching record (with Big Sky records): 2014 – 2-10 (2-6). 2015 – 6-5 (5-3). 2016 – 7-5 (6-2). 2017 – 11-3 (7-1). Total – 26-23 (20-12). Hill is thriving in Ogden, and Weber State's self-image is improving. The story is told of area high school graduates being asked where they were going to college and responding, “Just Weber” – as opposed to bigger, supposedly more glamorous schools. In recent years, student leaders sought to alter that outlook by creating the #JustWeber social media hashtag and redefining the word “just” to mean only or distinctive. 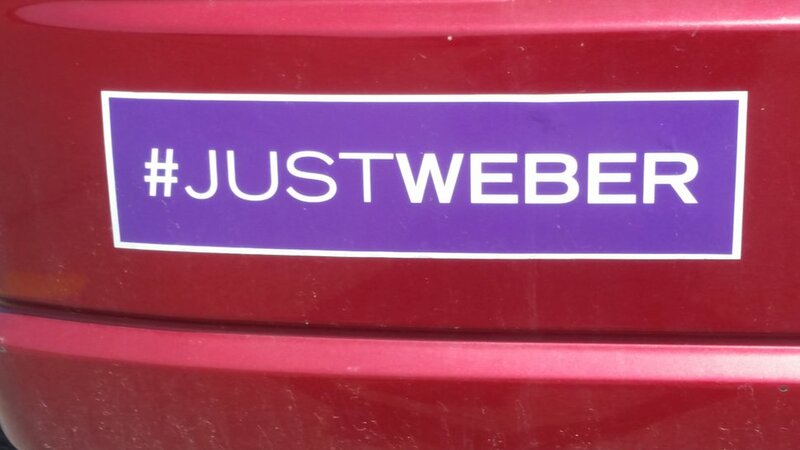 As this bumper sticker shows, the phrase "JustWeber" has become a source of pride for Weber State. #JustWeber for me was in relation to friends going new places for college while some of us stayed local to "just go to Weber"
i went full focus, was hugely impacted by my professors, graduated quickly, and went on to create multiple businesses. Swan arrived on campus nearly 20 years ago as a walk-on linebacker from Idaho and never left. Entering his 15th season on the staff, coaching inside linebackers and special teams, Swan has worked for five head coaches. Same story, when he interviewed for the job in December 2013. “It just fired me up to know that you can win here; there's everything you want in a school,” he said. The Wildcats have improved every year. At age 43, Hill has a nice career trajectory in the making. After an initial 2-10 season, there was at least mild interest from Whittingham or Hill (or both) in having Hill return to Utah as defensive coordinator. Now, he could be in play at any FBS school in Utah where there's a head coaching vacancy in the coming years. Big things already are at happening at Weber State, where ground will be broken Tuesday for construction of a 27,000-square-foot athletic facility at the north end of Stewart Stadium. Weber State's winning a bunch of football games in those two seasons couldn't cure her disease, but the Wildcats' success has helped. Another chapter begins Thursday at Rice-Eccles Stadium, where Jay Hill played and coached for Utah. And this prediction is safe: Five years later, the Utes won't lead 49-0 at halftime. Eight of Weber State’s full-time coaches have played or coached at Utah. Jay Hill, head coach. Played 1998-99, coached 2005-13. Brent Myers, offensive line. Coached 2003. Dave Schramm, offensive coordinator. Coached 2005-11. Kite Afeaki, defensive line. Played 2004-05. Joe Dale, safeties. Played 2006-09. Quinton Ganther, running backs. Played 2004-05. Al Pupunu, tight ends. Intern, 2007.